Gullfoss, or the “Golden Waterfall”, is a powerful waterfall of the glacial river Hvítá, running from lake Hvítárvatn at Langjökull glacier. It falls in steps and makes a turn between the steps before falling into a magnificent canyon. Glacier rivers are brownish because of all the sediments the glacier has carved off the ground. You can barely see the brown color in the waterfall but in special conditions the waterfalls looks golden and that is where Gullfoss takes it‘s name from. Gullfoss forms the popular Golden Circle route along with Geysir and Þingvellir. 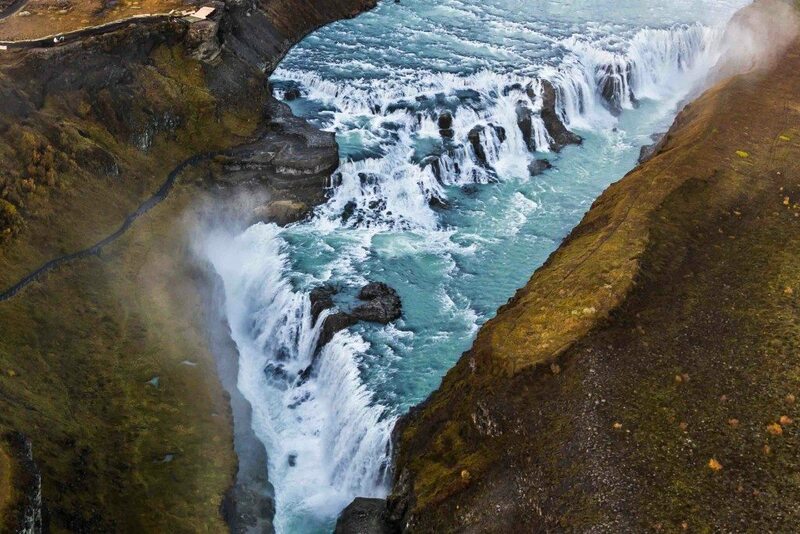 You can see Gullfoss from above on our Essential Iceland tour.